Bank of New York Co. has agreed to take over Mellon Financial Corp. in a $16.5 billion all-stock deal that will create the world's largest securities servicing company and one of the biggest asset managers. The new company, which will be called Bank of New York Mellon Corp., will be the world's leading asset servicer with $16.6 trillion in assets under custody. It also will rank among the top 10 global asset managers with more than $1.1 trillion in assets under management. But the companies also said in announcing the deal on Monday that they expect it will result in the elimination of about 3,900 jobs, or nearly 10 percent of their combined work force. They said the job cuts from a combined work force of about 40,000 would occur in the three years after the deal closes. They said reductions would be made through normal attrition "wherever possible." The companies expect to cut costs by about $700 million a year and said the deal will result in restructuring charges of about $1.3 billion. The deal has been approved by each company's board of directors, but requires approval by regulators and shareholders. The companies expect the deal will be completed in the third quarter of next year. Bank of New York's shareholders will receive 0.9434 shares in the new company for each share of Bank of New York that they own, and Mellon shareholders will receive one share in the new company for each Mellon share they own. That means Bank of New York shareholders would get about 63 percent of the shares in the new company. 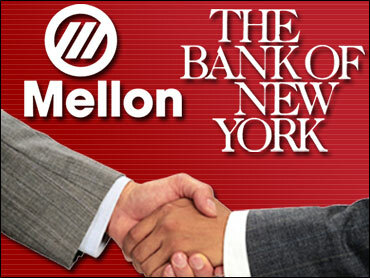 The board of directors will have 10 members designated by Bank of New York and eight members designated by Mellon. The new company's headquarters will be based in New York City. Thomas A. Renyi, chairman and chief executive of Bank of New York, will serve as executive chairman of Bank of New York Mellon for 18 months following the close of the deal, with overall responsibility for the integration of the two companies. Robert P. Kelly, currently president, chairman and chief executive of Mellon, will serve as chief executive of the new company and will succeed Renyi as chairman of the board. Gerald L. Hassell, currently president of Bank of New York, will hold the same position in the new company. Bank of New York and Mellon have entered into mutual stock option agreements for 19.9 percent of the issuer's outstanding common stock, the announcement said. In a conference call with reporters, Renyi termed the deal "a transformational merger" and noted that it came amid signs of increased consolidation in the asset management business. He said the combined company would be the largest securities servicing firm in the world and among the top four asset managers in the United States. Kelly said the new company would take advantages of the different strengths of the two institutions. "Mellon is huge in asset management and having a nice asset servicing ability as well," he said. "In contrast, Bank of New York is huge on the asset servicing side and security servicing but smaller in asset management." Still, Kelly said, "there will be expense synergies and opportunities for saving money going forward." He said that the combined company's cash management and stock transfer operations would remain in Pittsburgh.